"All bets are off" in Argentina" - as Bloomberg puts it - where the value of the local peso has plummeted, falling 20% this week alone. It is now 50$ weaker on the year versus the USD, making it the worst performing currency of 2018 and sending massive shockwaves through Argentina’s economy. The effect on business owners and anyone who transacts in local currency has been profound, according to Bloomberg. "There’s no clear price reference after the peso plunge," one business owner told Bloomberg. The price plunge has created havoc for him and his surgical equipment business, where he buys in foreign currencies and sells in pesos. 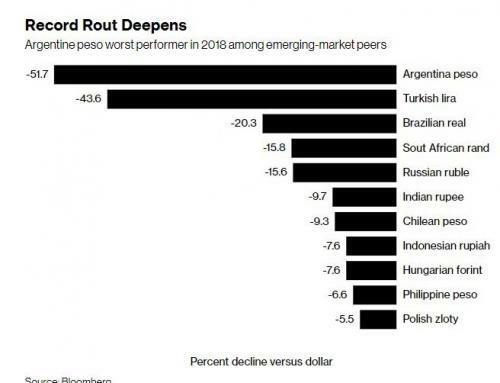 The peso crippling could also be a precursor to political unrest, as President Mauricio Macri’s chances of being reelected are reportedly falling, despite being known as a leader who has been friendly to the markets over the course of his tenure. However, as a result of the recent turmoil, he's "struggling" to restore investor confidence in the Argentinian peso. Argentina and its Central Bank have taken a number of decisive steps to try and halt the plunge, yesterday hiking interest rates to the world's highest 60%. Previously, the country had requested quicker payouts from the International Monetary Fund, which promptly granted the collapsing country's request. And speaking of Argentina $50 billion loan agreement in place with the IMF - the largest ever in IMF history - this isn't that too different from the country's 2001 default, when it was on a similar IMF loan program. Since then, the country underwent a "decade of budget-busting left-populist government – and isolation from world financial markets". Argentinian residents who voted for President Macri went on record telling Bloomberg they "wouldn’t do it again." President Macri's plan initially was to reduce the country's deficit slowly. The goal was to move it from 6.5% of GDP last year to 3.8% of GDP in 2019. Now, it is likely that the government will release a plan for an even lower target for 2019, reportedly below 1.3% of GDP, Bloomberg noted. The problem is that as Greece has shown, such "austere" measures usually end up in a cycle of economic depressions. "Our salaries are constantly eroding," 62-year-old union leader Ruben Garrido told Bloomberg. Even those at the upper end of the socioeconomic spectrum are feeling the brunt of the currency's plunge, but at least they seem to understand monetary policy better than the country's central bankers. Alicia Quadri, a dance teacher and former star ballerina at the prestigious Teatro Colon.